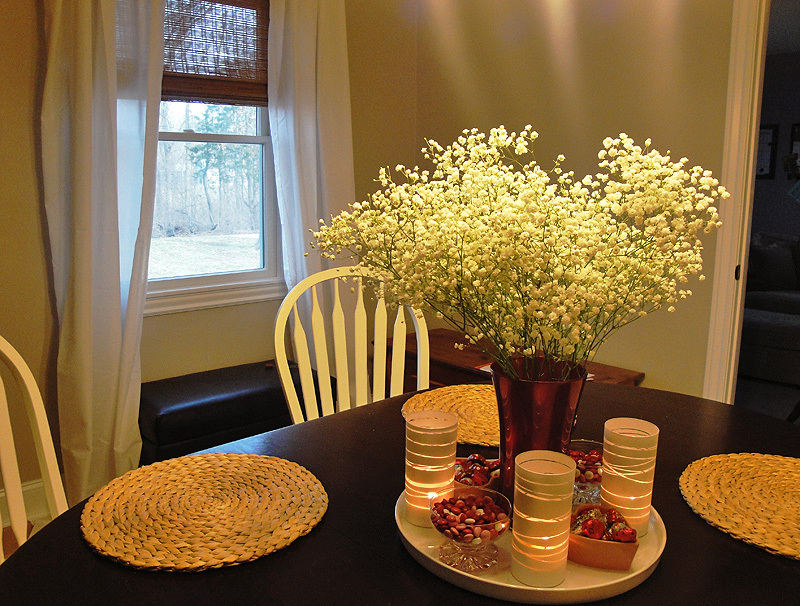 Now that I have a table and a complete dining room, I find myself wanting a monthly centerpiece. 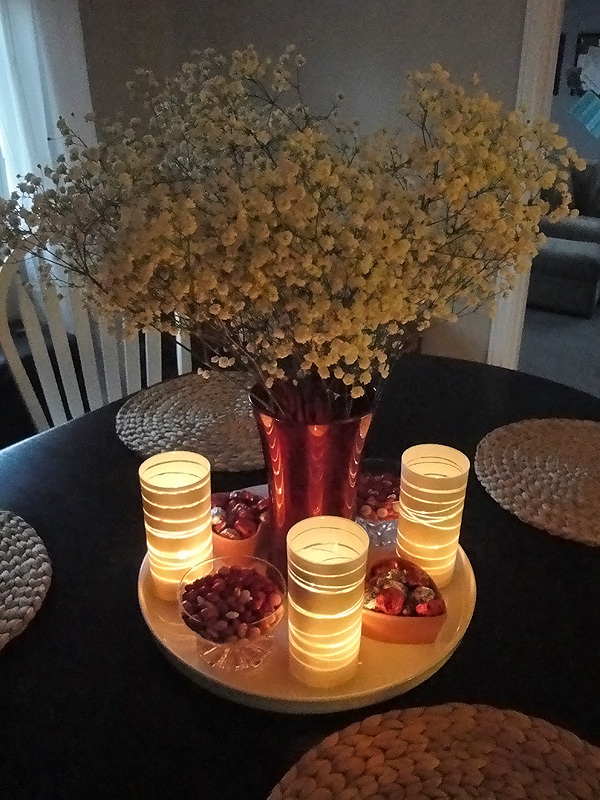 I’m still in the honeymoon phase with my dining room so consider my centerpiece the equivalent of me taking my dining room out for dinner and a movie. As you can see my centerpiece has some romance for Valentine’s Day. I’ve got candles, flowers, chocolates, and plenty of shiny things. I managed to keep this centerpiece very affordable. 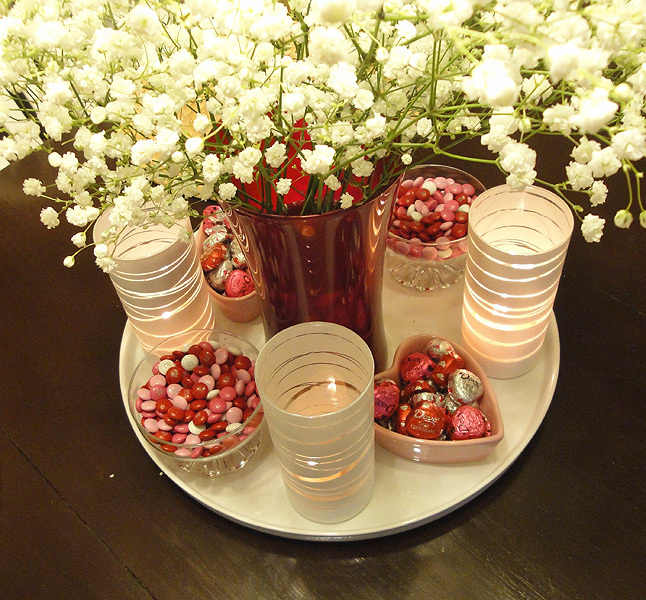 I used some dessert dishes that the original homeowner had left in the house, a vase from a Valentine’s Day years ago, heart shaped dishes I got in Target’s Dollar spot a few years back, candle holders I made myself, a $5 bouquet of baby’s breath, and chocolates I would have bought anyway. Plus, I’ve convinced my husband that I don’t need flowers for Valentine’s Day since I bought these and that’s a savings in itself. My favorite part (other than the chocolate) is how nice it looks at night. That’s worth the full $5 I spent right there and definitely cheaper than taking my dining room to dinner and a movie.